You are probably familiar with reading basic jazz chord shapes and you can work your way through a tune without too much trouble. The next logical step is to take that knowledge and then turn the basic jazz chords into rootless voicings and start adding more melodic variation and interesting rhythms. In this video I am going to go over how you can take a set of jazz chords for the song Lady Bird and then reduce them to rootless 3 note voicings. Then I will try to cover a way you can add more options for top note melodies and play an example of how you can use this. 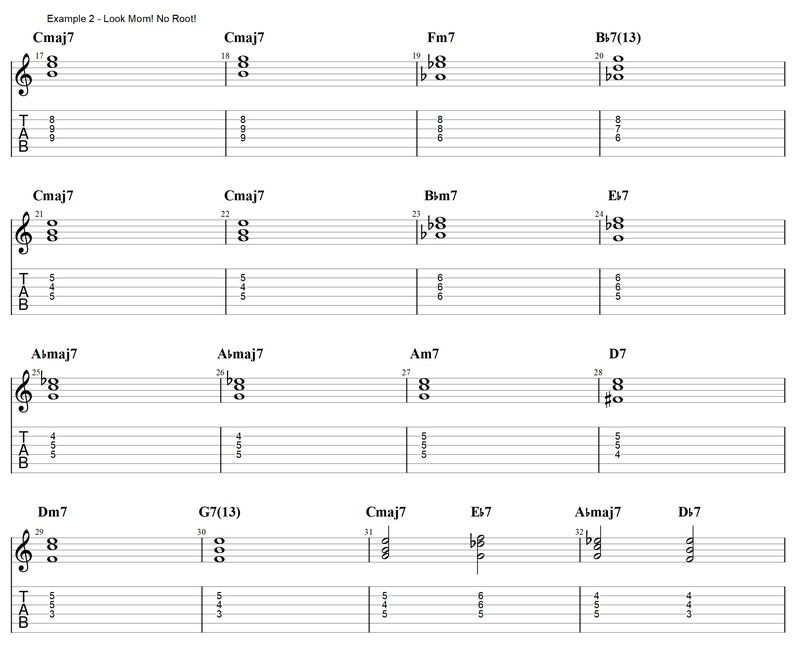 You can check out that lesson if you are not familiar with any of the chord voicings. Taking away the root is a fairly simple task since it is just removing the lowest note. More Melody and more rhythm! Now that we are using one finger less it is going to get easier to come up with some melodic variations by changing the top note of the chord. Once we have more than one melody note available for each chord it also starts to make a lot more sense to playing small riffs and explore more rhythms while comping. In example 3 here below you see the different options. I ket it quite simple so that everything is fairly easy to use and relate back to the original chord shape. For each of the chords there are 2 or three choices for top note. You can of course work on the different chords isolated to get started with making small riffs and then later try to combine them in the progression. I actually expect that once you have tried to make a few riffs with each of the chords you should quickly be able to do so. In the video I also show a chorus where I comp through the progression with this material improvising a melody through the changes. Taking a more sytematic approach. Besides the advantage of putting the ideas directly to use on a song it can also be very useful to take the concept through some of the exercises you may or may not already know for the standard chords. This will help you keep the overview of the chords even if you don’t play the root and also just open up for more options when playing the chords in terms of passing chords etc. Playing the more compact rootless voicings is a much more efficient way to play chords in an ensemble. The chords you play will sit much more in a register where they don’t interfere with the bass player and that also makes it much easier to get complicated rhythms to sound good. You should try work on this both on tunes and once in a while take voicings through a scale or inversions and work with the rootless versions. 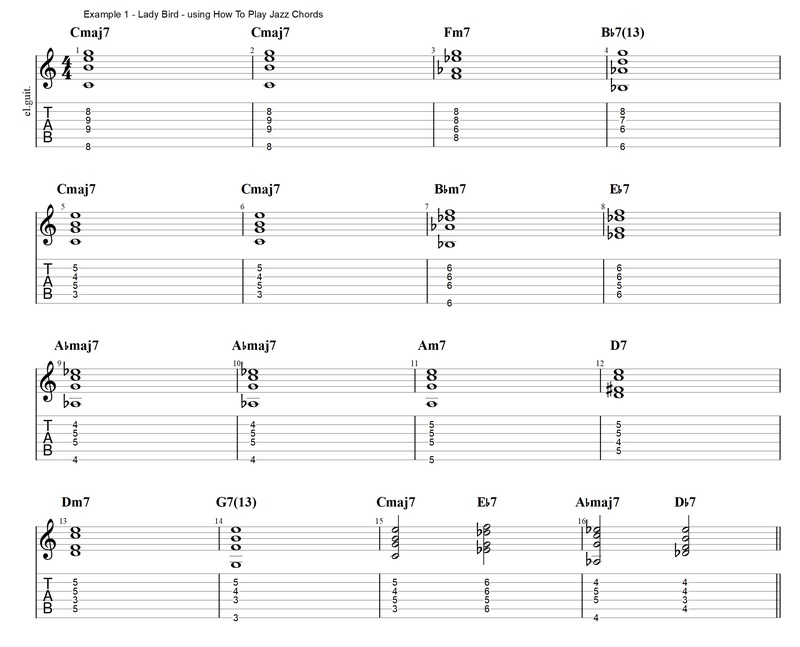 This entry was posted in Blog, Lesson and tagged guitar, guitar chords lesson, guitar practice tips, how to play jazz chords, how to play jazz chords on guitar, jazz chord, jazz chord survival kit, jazz chord symbols, jazz chords, jazz chords guitar, jazz guitar, jazz guitar chords, Jens Larsen, voicing, voicings on November 2, 2017 by jens.